I don't like to feel inadequate or incapable. I don't like being dependent on others. I don't like not knowing what's going to happen. I don't like feeling helpless in the face of a trial. I don't like feeling spent and overwhelmed. I don't like it when I am physically weak, emotionally weak, mentally weak, or spiritually weak. Did I mention that I don't like being weak? Our weakness is no match for Christ. It's not an obstacle he has to overcome. He doesn't look at us and bemoan the fact he's not been given the cream of the crop. Rather, he laughs at weakness and says "Look what I can do with it." If the reality of your own weakness is mocking you today, go to God in prayer. Plead with the Lord about it and rest in his power made perfect in weakness. I come to you today feeling so weak and helpless. There are many thing on my plate, so many worries, so many uncertainties, so many things that I just can't do. Every time I think about what lies ahead for me, I feel overwhelmed. When I consider carrying this burden for days on end, I feel like I just might drown. Everything seems impossible. You said to come to you with my burdens. The Bible says you are our "Rock" and our "Fortress." You are all knowing and all powerful. You know the burdens that I bear. You are not surprised by them. In fact, you've allowed them into my life. I may not know the purpose for them, but I do know that I can trust your goodness. You are always faithful to do what is best for me. You care most about my holiness, even above my immediate happiness. I ask that you remove this burden from me, take away my weakness, but ultimately, I desire most of all that your will be done. I confess that I hate this weakness in me. I don't like not knowing what to do. I don't like being incapable and insufficient. Forgive me for wanting to be sufficient in myself. Forgive me for wanting to be in control. Forgive me for complaining and grumbling. Forgive me for doubting your love for me. And forgive me for not being willing to trust and rely on you and your grace. When I look into the future and see my weakness, help me to trust you. May I, like Paul, embrace my weakness so that you can be my strength. May you work through my weakness to change me. May I glorify you in my weakness, looking away from myself and to the wonders of your amazing love through Christ. Grant me gospel joy, even in the midst of this struggle. It's because of Jesus and through Jesus that I can pray, Amen. 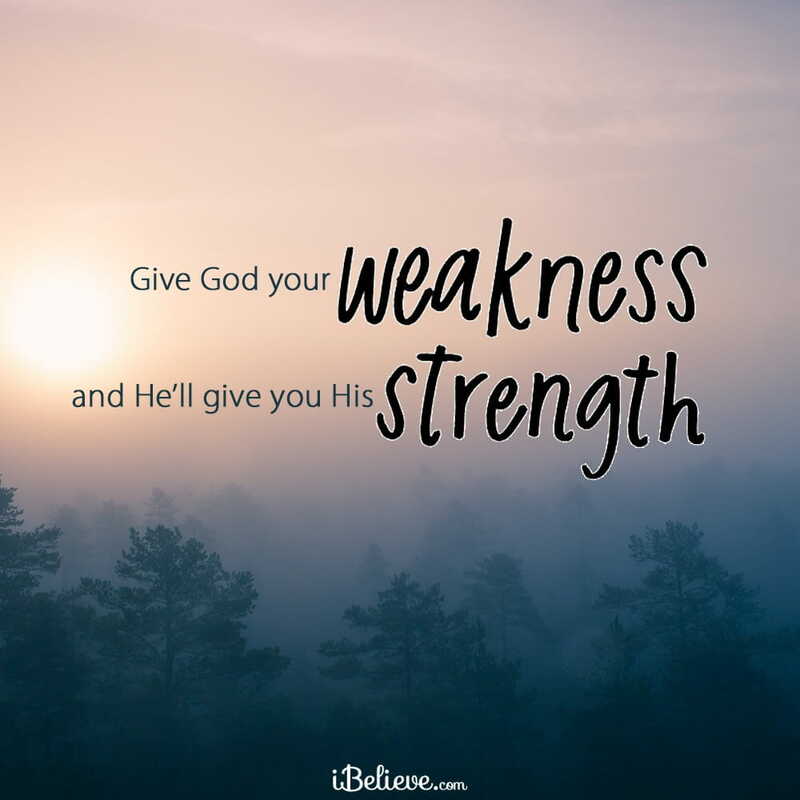 Editor’s Note: Portions of this devotional were taken from Christina Fox’s article, A Prayer for When You’re Weak. You can read that piece in full here.